The Story Of The Borders Railway DVD. "The Story Of The Borders Railway" produced by StuMedia. Priced £14.99 inclusive of p&p, it's the story of the rebirth of the Borders Railway after 46 years. The 87 minute programme is narrated by Paul Brownlee and features the very best parts from the series and new exclusive footage. Visit the website here. This programme is now available to digitally download here. 8-Disc DVD Box Set. DVDs SOLD OUT! "Borders Railway From Start To Finish" produced by StuMedia. Priced £39.99 inclusive of p&p, it's the story of the rebirth of the Borders Railway after 46 years. The Six Series and 34 programmes are all here along with the movie and an extra disc packed with 90 minutes of extra features. Over 12 hours it contains the most comprehensive coverage of the longest new stretch of railway in Great Britain for over 100 years. St Boswells RFC DVD Out Now. "St Boswells RFC - Right Up There!" produced by StuMedia. Priced £10 + £1.50 p&p, it's the story of St Boswells RFC's remarkable win at BT Murrayfield in the BT Shield. Over 80 minutes of exclusive behind the scenes footage and match highlights. Watch excerpt here. 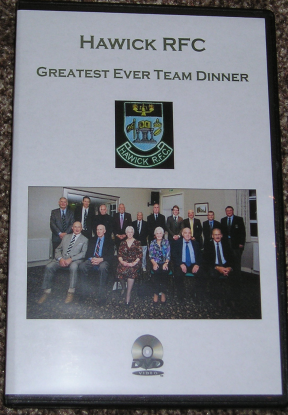 Hawick RFC - Greatest Ever Team DVD. In 2014 one of the Borders' greatest clubs, Hawick, polled their fans to come up with the ultimate Greens XV. It was unveiled at a special night at the club house at Mansfield Park and it proved to be an historic evening featuring speakers Iain Milne and Rory Bannerman with Ian Landles also present, as well of course as some of the Hawick greats including Stuart Hogg, Jim Renwick, Colin Deans and the late Hugh McLeod. Watch ITV report on the night here. Price: £10 + £1.50 p&p. Charity Video for Gala RFC - a twist on recent viral crazes! In 2016 we put together a video for Gala Rugby Club who were raising awareness of their local charity work. This was the result. In 2016 we produced a 10-part series on the quirkier elements of the Royal Highland Show. In this episode we met up with Ben Potter and his birds of prey. Sometimes it's not the production you put weeks of work into that goes viral - this is perhaps our most famous clip which took minutes to put together yet was seen over 3 million times! You may have seen it already but this is the original version when even the referee joined in the try celebrations! Celebrating the 50th anniversary of Motor Racing at Ingliston in Edinburgh, the thrills and spills in the sun and the rain - a flavour of three days captured all in 90 seconds. An episode of a brand new TV programme in HD available online for Sky Television and also on FreeView and FreeSat. An edited version of the movie we produced telling the story of the construction of the Borders Railway. Also available is an 8-DVD box set containing all 34 episodes and tons of extras. Our short film report for ITV on the very popular equestrian event at Floors Castle, where we caught up with Olympic Silver Medallist Ian Stark. An episode from the weekly rugby roundup we produced throughout the 2017 Sevens season. The Scottish Borders Motor Extravaganza is one of the highlights on the Calender, and this event went Back To The Future! The Common Riding season is a big part of the Scottish Borders culture. In 2015 we covered the Hawick Common Riding. Here's a taste of events from the morning featuring 308 horses! George Inglis has enjoyed six number one singles in the British & Irish Hotdisc Chart and this video was directed by Stuart Cameron for use in the film "The Story of the Borders Railway." Historic footage of the very first test train to come down the line from Edinburgh to Tweedbank on Tuesday 12th May 2015. The Kings of the 7s reached its climax at Jedburgh on Saturday 17th May 2015 with home team Jedforest winning its own tournament, but Gala took the K7s crown. Former Poppy Girl Megan Adams won the hearts of millions as one of the Poppy Girls at the Festival of Remembrance in front of the Queen and the Prime Minister and a huge BBC TV audience. She has now launched her first solo single with StuMedia producing the video for it. It is well on its way to 200,000 views. For more from our archive connect with our Vimeo channel. Our entire rugby footage spanning 10 years can be seen here.